Appearance: Nice light mahogany color with thick two finger white head. Head lasts almost entire beer but lacing isn’t that great. Very good looking beer! Smell: Sweet malts with a little hops and grain added in for good measure. Smells a lot like other beers in the marzen style. A nice clean smell that is quite appealing. Initial Taste: Not too bad. Very smooth sweetness of malts matched very well with a spicy hoppiness. Very little bitterness in this beer but JUST enough to balance out the sweetness of the malts that make up the core of this marzen. The flavor is sweet but light enough to keep on drinking. Aftertaste is a subtle lingering sweetness. Thoughts: What a surprising beer. I didn’t have much hope for this beer when before I first tried it. Being made by Michelob I just assumed it would be like the rest of the American watered down brews like Budweiser and Miller…but boy was I wrong. This beer is one of the smoothest beers I’ve ever had the opportunity to drink. 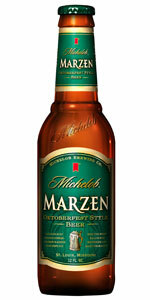 Michelob has done a great job in making a smooth, highly drinkable, German Marzen beer that does not fail to deliver. There are other Marzen beers that represent this style a little better…but none as easy to drink. Definitely my favorite beer from the Michelob lineup, which while that isn’t saying too much, is still worth a try.